The Dhaka Dynamites have got a terrific record in the playoffs but have lost both the games against Vikings this season. By winning their last league game, the Dhaka Dynamites successfully made it into the playoffs of Bangladesh Premier League (BPL 2019). However, to see them finish fourth on the points table after the dominating performances initially was slightly disappointing. Though, the team has a wonderful opportunity ahead to make up for the losses in the second half of the tournament. They will take on the Chittagong Vikings in the Eliminator and both these teams will draw their fortunes. The winner will proceed to the second Qualifier while the loser is knocked out of the tournament. The Vikings emerged victorious on both the instances when they took on the Dynamites this season. While they’ve got a psychological advantage, the Dhaka team has the home advantage. 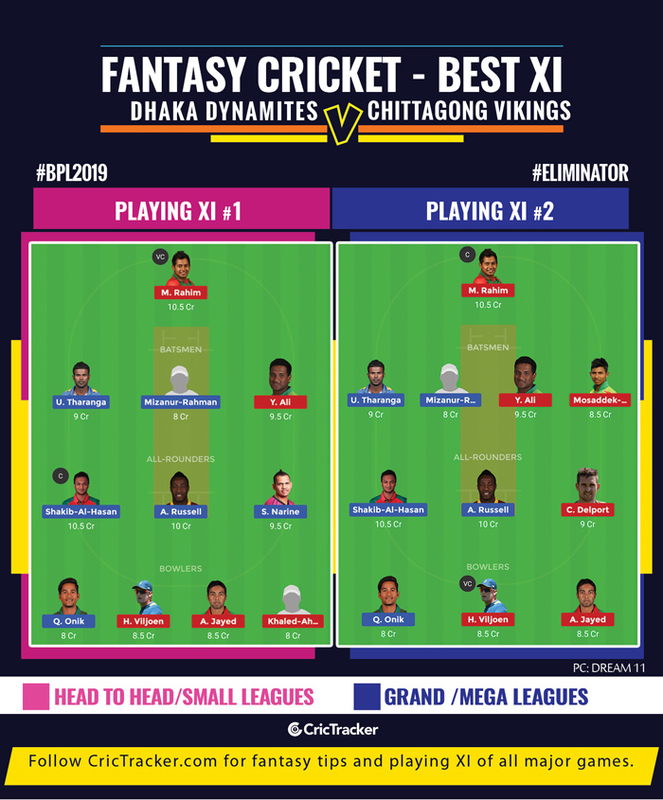 The Eliminator of the Bangladesh Premier League (BPL) 2019 will be played between Chittagong Vikings and Dhaka Dynamites at the Sher-e-Bangla National Stadium in Mirpur, Dhaka. The match starts at 1:30 PM local time (7:30 AM GMT) (1:00 PM IST). The Dhaka track has been slightly unpredictable in the tournament. While a few teams have registered massive scores, the other teams collapsed leading to severe embarrassment. The batsmen will have to be extremely cautious with their shot selection and should avoid playing across the line unless they’re very confident about the same. Cameron Delport, Mohammad Ashraful, Yasir Ali, Mushfiqur Rahim (C & WK), Sikandar Raza, Dasun Shanaka, Mosaddek Hossain, Nayeem Hasan, Hardus Viljoen, Abu Jayed, Khaled Ahmed. Bench – Mohammad Shahzad, Luke Ronchi, Sunzamul Islam, Nihaduzzaman, Shadman Islam, Robiul Haque, Robbie Frylinck, Najibullah Zadran. Mizanur Rahman, Upul Tharanga, Rony Talukdar, Shakib Al Hasan (C), Sunil Narine, Nurul Hasan (WK), Andre Russell, Kieron Pollard, Qazi Onik, Shuvagata Hom, Rubel Hossain. Bench – Heino Kuhn, Hazratullah Zazai, Mohammad Naim, Darwish Rasooli, Andrew Birch, Mohor Sheikh, Shahadat Hossain, Ian Bell, Aliss Islam, Rovman Powell, Qazi Onik, Asif Hasan. There is no update regarding Robbie Frylinck’s fitness. Hardus Viljoen returned with the figures of 4/25 on his BPL debut. He has been in great form of late in T20 leagues across the world. In the T10 League 2018, he accounted for 18 wickets in 9 matches at an average of 7.77 and an S/R of 6. He was leading wicket-taker in the tournament. The first preference as your captain or vice-captain should be among Mushfiqur Rahim, Shakib Al Hasan and Andre Russell. You can consider Sunil Narine, Upul Tharanga and Kieron Pollard as the possible options for the vice-captain. Cameron Delport, Rony Talukdar and Hardus Viljoen are the other options from whom you can pick a multiplier. The Dhaka Dynamites might win the match.